Keeping a sketchbook is essential for the working cartoonist or illustrator. It's a place to draw freely without the fear that someone will see your poor rendering of a bicycle. It's a place to return for reference about what a bicycle (sort of) looks like. It's a place to stow away underdeveloped or misguided ideas, in hopes they'll someday amount to something. It's a place to search madly for usable ideas when faced with a serious creative block. A visual artist who doesn't keep a sketchbook is like an author who can't find the time to read: they may be able to get the work done, but they won't have near as much fun doing it. The other conclusion is that anyone who is afraid of making mistakes will never get anything done. 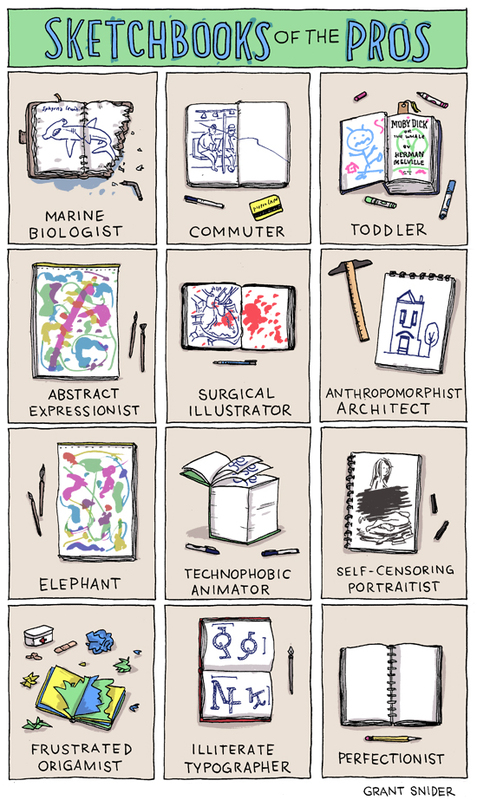 I know of a few artistically minded friends who were like that. They would take forever and a day on their drawings and paintings. I love this! I was reading through, trying to find the one that best fit me... Ah, of course, the perfectionist. Speaking from experience, the commuter one is highly accurate. Nice work! The commuter one looks the same as my high school's note/sketchbook especially during math classes..